"Ickie and Panther_99FS were notified multiple times but seem not to care that they have this scumbag on there forum!" 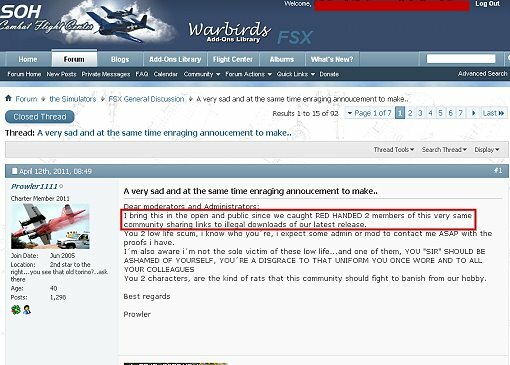 Oh oh what i discovered...this is what you can read in a flightsim forum and not written by icarusgold but a mr DeanWitman, another visionary as icarusgold? as you can see and not wrote by me The Admins, Moderators and Staff of Sim-Outhouse knows perfectly that there are pirates into their members but don't do nothing violating privacy laws themselves..this is just a report about other people wrote...not icarusgold...waiting an open letter for mr Whitman now. hey sim-outhouse perhaps you didn't understand english but you should is your native language...i didn't wrote any different from your member prowler here, he catched two sim-outhouse members pirating his product...not sim-outhouse but two of their members...it is seems clearn that a domain can't pirate but one or two members yes, or it too difficult to understand? I never say sim-outhouse but i catch members as prowler catched too! where is the difference? publishing also personal details on a public forum and without any authorization from us violating the Privacy act 2005 show clearly how Sim-outhouse act. They use their language violance and anything else against is not agree with them. Hey Canelo kid, you maked nice images of our Grumman duck, who passed you our Grumman Duck? you didn't buy it!! And congratulation Canelo kid...you and other admins often ban people because of some violation and then you publish privacy details of people violating federal law on privacy...well done. Now if you want have reason, it's yours...never talk with stupids, they take you at their same level and won for experience. Go out enjoy life instead passing on forums shoting at etc etc. 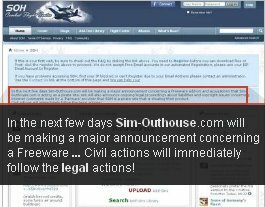 In the next few days Sim-Outhouse.com will be making a major announcement... We will also announce ongoing legal proceedings about liabilities and Civil actions will immediately follow the legal actions by a 'Payware' provider that SOH is a pirate site that is stealing their product. We are a Payware provider? i didn't know. 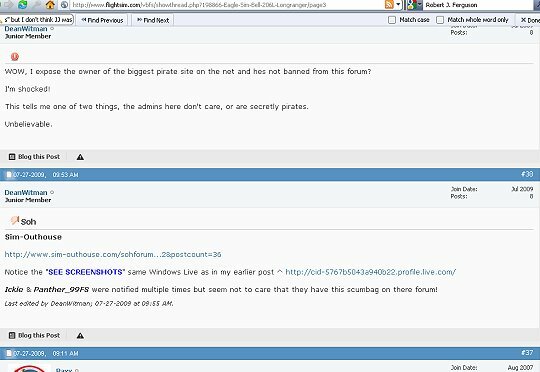 We wrote they are a pirate site? No...we wrote we catched few of their members acting as. You think we are mad? 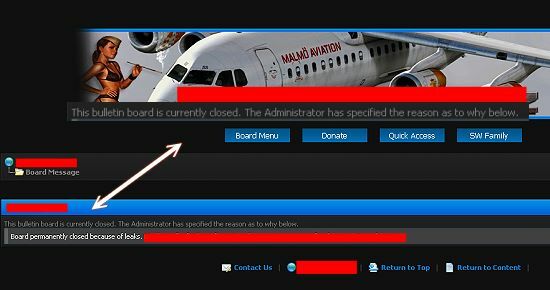 There are many others services as mediafire, rapidshare, etc that should be closed and that actually are used by pirates. 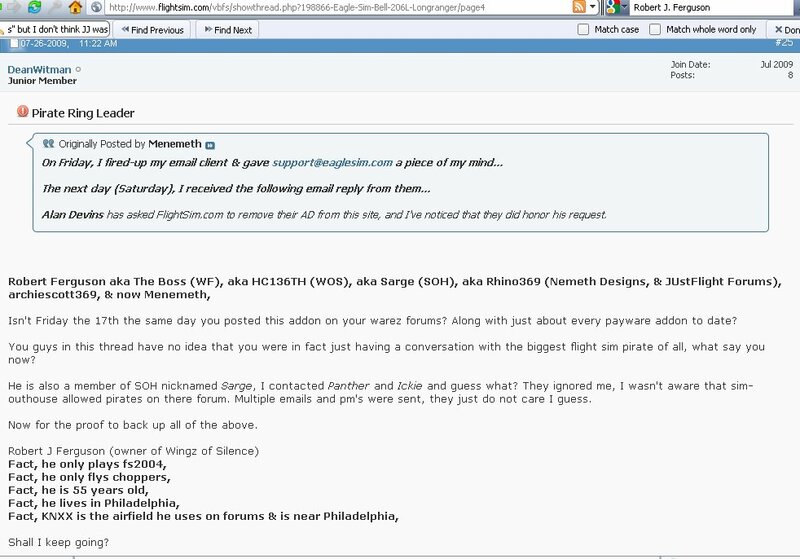 The Megavideo and megaupload closure it's a beginning but the war is long...we have emailed f.b.i. too with a list of people adding their names, surnames and addresses. Man your problems have an answer:PIRACY ! Commercial Vendors are tired to have cost and no revenue. That's why soon there will not be new reviews or products, and especially aircrafts. The new models number in the last year much lowered. It's rare seen three new models each month. Two years ago there were at least ten new models each month and more active developers. Why someone have to go to an expo and buy products and why a commercial vendors should spend thousands of dollars for travel, move hardware, etc when people can get something free at his home. That's the problem. The piracy problem will ruin completely this hobby in two or three years or sooner. Two big developers stopped their product, low numbers by payware and freeware developer, expo stopping activities..if you do not see those as the end of flight simulation on the web you are a stupid...say thanks to pirates...there are many categories created the problems...people sharing products...few unhonest skinners, some freeware people that hate payware, few unfamous website with members exchangin payware products..
We had two choice..stay with unfamous people in an unfamous forum and approving they exhchange our products without pay. This probably didn't create problems and didn't hurt them and we didn't see post against us now and on future or polemics about us. No sorry but i am not an opportunist as few other payware developers that knows the true but continue to stay between them. I remember very well a developer claiming being best payware developer and so on... claiming he is into this world since fs95, contacting our gladiator's customer making skins...then magically appeared another gladiator (it's not our model) with a "gun effect" that they didn't know how build. This same individual when few years ago started a lysander started a polemic about they had one in their shop (you are the westland's ownier or have the trademark?). As you can see we didn't finish the lysander, he then started two new models we had on sale or coming soon. Obviously he can but it's fun seeing how people accuse others and then did same things and double. This same individual tried also to create problems to an external shop because they used the term MARKET. Those are the individuals and part of this hobby. If you like them, i don't.